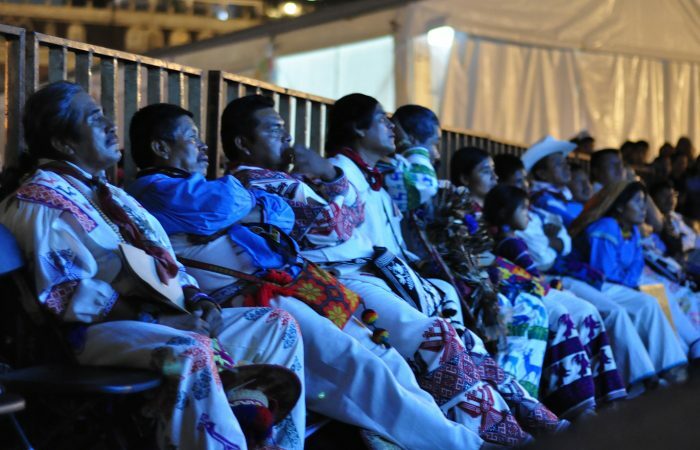 MEXICO CITY – As part of the opening of the Festival of Indigenous Cultures of Mexico City, “Huicholes: The Last Peyote Guardians” was screened on Aug. 28 in the Zócalo. 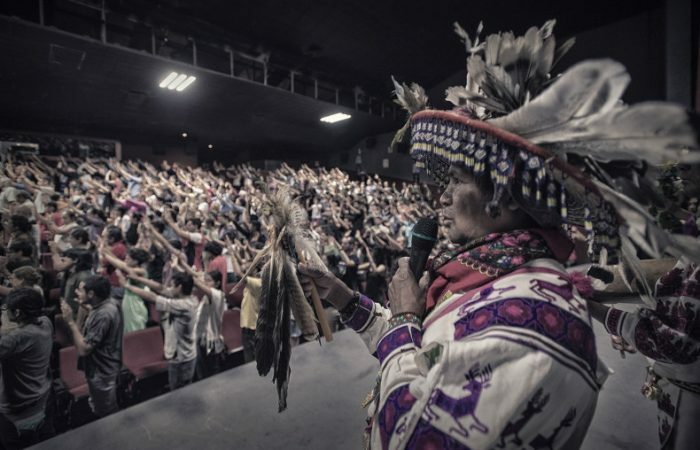 This projection on such an emblematic stage, in the historic heart of the city, with the greatest number and diversity of people from indigenous American cultures, has come to realize a dream long woven by the producers of the documentary. The film was presented by members of the production crew, by members of the Ramirez family of Laguna Seca (featured in the documentary), and traditional Wixaritari (Huichol) authorities from the communities of San Andrés Cohamiata, Santa Catarina Tuapurie, San Sebastián Teponahuaxtlán, Bancos de San Hipólito, the Wixárika Union of Ceremonial Centers and the Wixárika Regional Council for the Defense of Wirikuta. Prior to the screening of the film, Eduardo Martín Vázquez, Secretary of Culture of the Federal District, welcomed the Wixárika authorities the Festival of Indigenous Cultures of CDMX, and held a meeting with the production crew of the documentary and several allied civil society organizations in a hall of the Historical Archive of the City of Mexico, in order to reach agreements on the promotion and dissemination of the film, on the organization of future projections in the Huichol Sierra communities, and also began studying joint projects that could be realized from the resources the movie generates. The main agreement that emerged from the meeting was the certainty and joint work together to defend the sacred territory of Wirikuta, and under this premise, also support the promotion and dissemination of the documentary that is currently being used to carry the message of the Huichol culture the world. 1. We will work together as a unit for the defense of Wirikuta. 2. 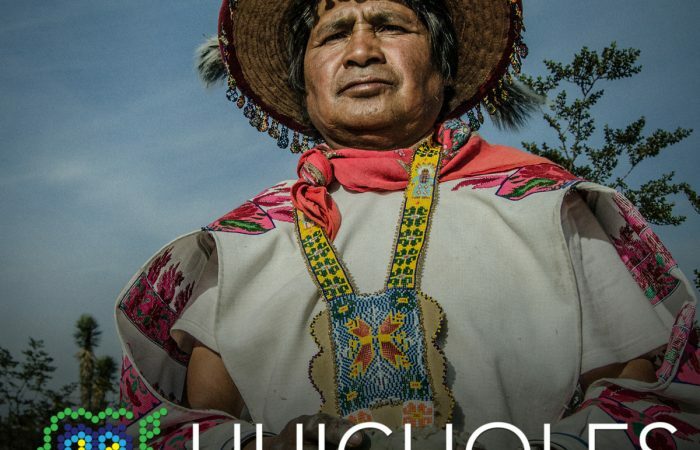 We will support the promotion and dissemination of the film “Huicholes: The Last Peyote Guardians” by Hernan Vilchez, as an action that is part of the defense of Wirikuta. 4. The funds raised by the documentary “Huicholes: The Last Peyote Guardians” will be used to fund projects that benefit the Wixarika people, payment of debts arising in the implementation and launch of the film, as well as in the promotion and dissemination of this film in the future. The order of priorities and percentages as well as projects to be implemented will be discussed in future meetings. 5. We will jointly organize the screening of the documentary “Huicholes: The Last Peyote Guardians” in community assemblies in Bancos de San Hipólito – Uweni Muyewe (Durango), San Sebastián Teponahuaxtlán – Waut + a (Jalisco), and Santa Catarina – Tuapurie (Jalisco). 7 We will set the date for a subsequent meeting on 21 and 22 November this year to bring responses to assemblies and to move forward in this process that has started. Music is essential in the daily and ceremonial life of the Wixárika People. Hence, the makers of Huichol: The Last Guardians of Peyote put special care that the music was a subject of history. We have had the great privilege of having the Argentine multi-instrumentalist and composer Gastón Salazar contribute his sensitivity in the composition of the soundtrack of the film, together with the ceremonial music of José Luis “Urramuire” Ramirez and his family, and the contribution of a group of artists who resonated immediately with the project. This work, carried out independently at the request of the elders of the community of San Andrés Cohamiata in the Huichol Sierra represents a combination of efforts and talents committed to life. José Luis “Urramuire” Ramirez, star of the documentary, is a marakame, spiritual guide and healer, musician and artist who has guided his family and his people faithfully, keeping the ancestral heritage of their culture and worldview transmitted from generation to generation. Playing their instruments and sharing their songs, they have traveled many places, carrying the message that allows all people to return to the path of respect and harmony with life. Gaston recalls, “The themes of the composition explored the ancestral, the sacred, respect and care for a nature that is arid but alive, and the feel of the iconic ancient culture that is defended. The sound began to flow from the heart, as an ode to the guardians. In its footsteps on the dry mountains and the desert, to the sound and strength of its women, the magic of shamans that heal and children who watch; to the water as the most precious good in the land, the life source. To those working in mining and those who no longer want to return to it. To the uncertainty of the future that we are all writing through our consciousness and our actions, individual and collective. Continuing the pattern of independent distribution and using digital platforms with the intention of transcending borders, we publicly make available online this release of the soundtrack. Income earned by download will benefit all the artists who participated in the composition and interpretation of it, and to support the promotion and display of this powerful message of ancestrality and life. 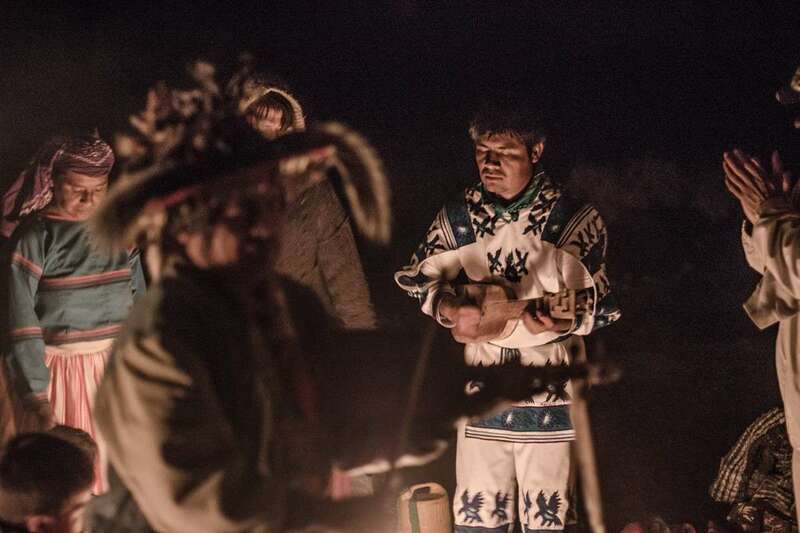 feature documentary Huicholes: The Last Peyote Guardians, directed by Hernan Vilchez,, whose world premiere was held at Real de Catorce on May 17, received the Audience Award at this second edition. Also received the Award from Signis Argentina Catholic Association for Communication. In presenting the recognition the jury found that the documentary was awarded the prize “for their commitment to environmental protection and respect for indigenous peoples and its profound For its cinematic quality where perfect mastery of the audiovisual language stands out.” The director, Hernan Vilchez, received both awards on behalf of the entire production team of the film. As part of the second edition of the International Environmental Film Festival (FINCA), 29 films were presented (features, medium-length and short films), of which 14 titles were part of the Official Competition in the Mines and Petroleum, Food Sovereignty, Biodiversity and Sustainability, Waste and Pollution sections. Huicholes: The Last Peyote Guardians is currently showing in theaters in Mexico City, showing at El Bicho Forum(Colima 268, Colonia Roma) every Tuesday, Wednesday and Thursday of August at 21:00 h. Also it will be shown at Cinema Tonala (261 Tonala, Colonia Roma) Sunday Aug. 3, Thursday Aug. 7, Saturday Aug. 9, Friday Aug. 15 and Sunday Aug. 17 . José Luis “Katira” Ramírez was serving as the governor of his community of San Andrés Cohamiata, Jalisco, when he met Argentine filmmaker Hernán Vilchez. He was not like any governor Vilchez had ever met. 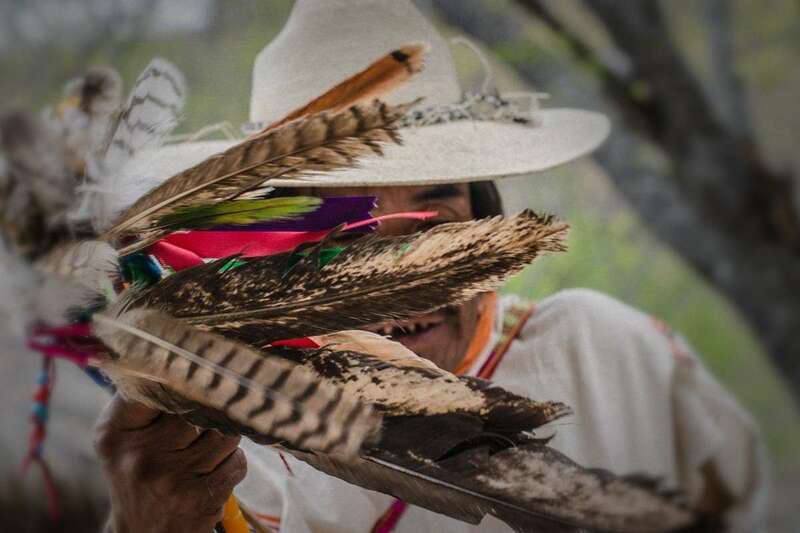 A Huichol shaman, or marakame, dressed in his colorful native clothing and distinctive plumed hat, he stood out in the urban environment of Mexico City. He had traveled far from his home in the Western Sierra Madre because his community was in crisis; the rains had not come in time, and the corn crop was ruined. He had come to the megalopolis to seek support for his people, who were in dire need with their failed harvest. Another crisis, too, loomed large in his mind: the fate of Wirikuta, the sacred land of his people, destined to be churned into ore by Canadian mining companies. He had no idea how it would be done, but he knew it had to be stopped. The fate of his people – and indeed, of the entire planet, according to his perspective – hung in the balance. Hernan, for his part, was traveling the planet with his film crew, seeking subjects for a German reality show that portrayed the cultures and traditions of native peoples around the world. He asked Katira if he would be willing to participate in a filming of the program. Katira said he would consult with the elders of his community, and together they would decide. Eventually the community gave their blessing, but they asked for something in return. They wanted Hernan to film the story of their struggle to save Wirikuta. Katira’s family became the protagonists in the documentary, which follows the building of an extraordinary movement. I sat with Katira and with his son Clemente, a student at the University of Guadalajara, at the closure of the very intense Mexican film release tour to get a different perspective on the story behind the film. Producer Paola Stefani joined in at his invitation. racy: Katira, how was it to live with this film crew in your house, in your life, filming every day? Because of what I know of the Wixarika people, it’s a very private culture, very discreet, and people value their privacy very much. Katira: Yes, it was very difficult. There were many people who think many things and said things to us (critical things), but you only think of the defense. I always said in the assembly, you also should do the work, this is what it costs. If there’s no support, it’s painful, but one does it because really they do it from the heart, because really they love the Mother and the territory, and also we have rights as guardians on this planet. Tracy: I know that there are various documentarians who go to the sierra and ask for permission to film. Hernán is not the first; so why did you choose him to do this movie? Katira: He has a heart to especially know us. It wasn’t his first time to come to an indigenous community; he had been to communities all over the world with almost the same problems, the same needs. So when we met it was like we had already known each other for many years. Tracy: What were the most difficult challenges for you in this process? The difficult thing was the distances, and because of the distances the cost of everything – it’s very far and that’s why, with work and with sacrifice, we did it. Don’t think it was cheap; each trip was 1500 euros, 1,000 euros, from my pocket, from my work, but working together and with a lot of economic sacrifice we were able to do everything we needed to complete this documentary, so one day people will understand. Thank God my heart is very strong, because I wanted to leave something for the children, for the grandchildren, for the future, because I’m not going to live 500 years, 300 years, who knows what’s going to happen; so this was very important for me. Tracy: I really loved the opening you gave to the film in Guadalajara – the ceremonial blessing, the invocation of the five directions. I was curious to know if you opened each of the presentations with a benediction like that one, or were they all different? Katira: Very different. Sometimes we arrived rested; other times the director was really sick and weak from so much travel, with the rains, with headaches, we had to take care of each other that week of the release tour. Tracy: Katira, I know as a marakame you are also a healer, among other things. Were there times when you served as a healer for the film crew? Katira: Yes, laying the hands on energetically, healing, that’s how we’ve always cared for each other. Tracy: I’ll bet you had a lot of work, no? Tracy: And did the treatments work? Katira: Here’s Paola; ask her. Paola: Yes, he helped us a lot with the stress. The most stressed were Hernán, me and José Andrés (Solórzano, the photographer). On the tour we had moments of stress, and Katira calmed me down – with his words, with his hands, with his feathers, with the candle – yes, we had many moments, and we had many blessings. In terms of the blessing at the opening of the film, we began the journey from this house, and we did the salute to the five directions, and we asked permission here in the patio of my house – we always had a ceremonial moment. Not necessarily in public, we didn’t plan anything. Yes, in Guadalajara we did it in public to give thanks that they were accompanying us. But every presentation was different. The one in Guadalajara was very beautiful, the benediction that Katira and his family gave, it was important. The morning after we arrived in Real de Catorce, Katira and the whole family climbed the Cerro Quemado (the sacred mountain in Wirikuta) to ask permission to show the film. At each place we arrived, we asked permission – not always in public. Since it went so well in Guadalajara we were going to do it here in Mexico, but then we didn’t because it was raining. So each function was different. I think it’s something so much of the heart, it’s not a show. We went along doing what our hearts and our energy told us and what Katira finally decided. I liked very much that in Guadalajara Hernán and I didn’t even talk. In others Hernán and I talked, sometimes just Hernán, Katira always. It was like an open script. Katira: Yes, so we were all taking care of each other. This was our strength, this was the most important, to have love and peace, this is what is required. Tracy: And who treated you, Katira, when you had stress and headache? Katira: I treated myself. My creator, the place I come from, the adored essence… that’s how it is. Tracy: I know you have gone many times before to the Cerro Quemado, to Real de Catorce, but in a ceremonial way. How was it for you to go this time, in this context? Katira: When we went to the ejidos (communities), people were very interested; they all knew about it, because some are concerned about their water, the springs, and this made me feel that – of course it made me sad, because if they do this type of work, personally it made me feel really sad for them, because some of them are now old, they have their experience, and it was sad, because if they do this work, and contaminate the water for the families… it made me very sad. Tracy: Did you have many conversations with people from there? Katira: Yes, we spoke with our hearts and personally, and there aren’t that many who are in favor of the mining. What they did in Catorce and La Luz and Coronado, many people came from there, and in favor of their water, in favor of us. Tracy: Katira, I’d like to know your dream, your hopes for this movie. Katira: It’s something very deep, realizing that beyond where we can see, the prophecy, the knowledge, the medicine man with his sacred seed, he goes waking up the people, waking the soul, the mind. This dream is was very special for me because it’s what really I am here for: to share the message to care for the planet, for all of humanity. I hope this presentation opens a path for a film presentation tour – because there are many people who want to support us but we have to see if it will be possible. Paola: The intention, of course, is that we want to do tours – South America, the U.S. and Canada, and Europe. Now we have to rest a little from this; we have hundreds of e-mails where they ask us to bring the film – but it’s a little bit expensive. We’d like to bring five or six Wirras (Wixaritari or Huichols), José Andrés, Hernán and I … the thing is to combine, to travel …to join forces and go to these regions – and in Mexico, of course, also to go to present in different places. It’s a little bit complicated because the Ramírez family also has their agricultural and ceremonial calendar, but yes it interests us to be able to take this film and travel together. We hope people will organize showings to support us with the diffusion of the message. On the website we explain how to organize a showing. Right now everything is online. If they require the presence of the production crew and the Ramírez family, this implies a bigger cost. We have to get passports, all of this. You traveled to Vancouver with the Wixaritari authorities….you know what it takes. So we can’t get ahead of ourselves because we want to do things well. People are very anxious to see it – it was a huge effort for us, emotionally, economically and also organizationally. The thing is, we’ve incorporated into this marvelous family – to live together for 20 days, now we know each other, we know how we are together. It’s a beautiful feeling that we can put together these journeys, and their presence is very important. Obviously right now we’re on the Web – it’s important to do the distribution of this movie on demand, because with 4 dollars by 4 dollars, we’ll recover some of what we’ve spent in the production, and also to continue with the promotion and the distribution. We’re trying to stay with independent theaters and we are the distributors and we will manage our agenda. But yes, we are going to travel, Katira. (Katira smiles) He has received a lot of invitations from all over the country, from Tijuana, San Luis Potosí, Querétaro – everyone wants to project the film. We’re currently working on organizing that. Tracy: Clemente, what was the reaction of your teachers, your classmates? Clemente: Our school’s director has gone many times to the Wixárika communities, and he told us to never forget our roots. So I told him about the pilgrimage and he said it wasn’t a problem; rather, he supported me to learn the material and said I had to learn the other cultural, spiritual material, too. At the beginning I didn’t know the film would be different. You know there are films that have been made with our companions in the community but it was different. It wasn’t until later that I realized it would be a film about all the people who were interested in defending Wirikuta. The film isn’t just of one family or one community; it’s about everything, at the national level. It’s something very big for us. Tracy: How was it for you to be in Real de Catorce, knowing all the tension that has existed in the community surrounding the mining issue? When we went to Real de Catorce I didn’t know how the people would react. I was afraid they’d confront us for the fact that we were against the mine. If something would happen – honestly we didn’t know how the people would react. I was really afraid in Real de Catorce. Tracy: So what happened? What did people say to you? Clemente: (laughing) I hid a little bit. I never was in the front. Instead I was in the back behind a lot of people so they wouldn’t ask me questions, because maybe they were going to argue. When the film ended many people applauded, and in this moment I felt like we were doing something that is nothing more than part of us, as the Wixárika people. I think they understood a little bit about what it is that we do in the pilgrimage. That we are not against them; rather, they understood this is a union between the Wixárika people and the mestizo people of the pueblo. Tracy: Clemente, the readers of this article will be all over the world, and many of them have never heard of Wirikuta; they will never go there, and many maybe haven’t even heard of the Huichol people. Why should readers like that care about this issue? Why would it be important to them? Clemente: There are a lot of lessons in Wirikuta, for us and for everyone else. Many people think we just go to leave our offerings. It’s really much more than that; we are going to receive the energy and the light the dawn gives us. It teaches us a lot, listening to the words of the elders. One arrives being in the moment, listening to the words of the marakame – if you haven’t been there, it’s hard to understand what it is we are defending. The energy is felt the moment you are there. The truth is when one consumes a piece of Hikuri (peyote), that is where you understand, you find the sense of why we are going on the pilgrimage, going to the sacred places. Katira: I think it’s very clear we are defending the life of human beings. We are defending the sacred territory, and after this we are defending life on the whole planet. We are also defending the hikuri. For other people the hikuri is nothing, because they don’t know what it is, they’ve never tried it. I think with the presentation of this film, they will understand – it’s not just defending the hikuri and the sacred place. We are defending life, defending a people, so we can continue to do our ceremonies, we are the ones who are the last ones, so this doesn’t come to an end, because there are various indigenous communities that have lost everything. What they want to do is tear the heart out of our temple. This cannot be, because we are the priests of the Huichol world, and there is our temple. How is it that someone can go and tear it down and rip out its heart? Well, no. This mine, this gold is the heart; that’s what speaks, that’s what’s connected to the five cardinal points, and that is important for us. We must save this place. Tracy: Katira, what do you believe will happen in the world if Wirikuta is destroyed? Katira: We have realized there are many earthquakes, many problems, híjole, the Mother defends herself too, and why not? It could be the end of us, we have to defend it. We have to each give our grain of sand. So for us in San Andrés Cohamiata this is the task. 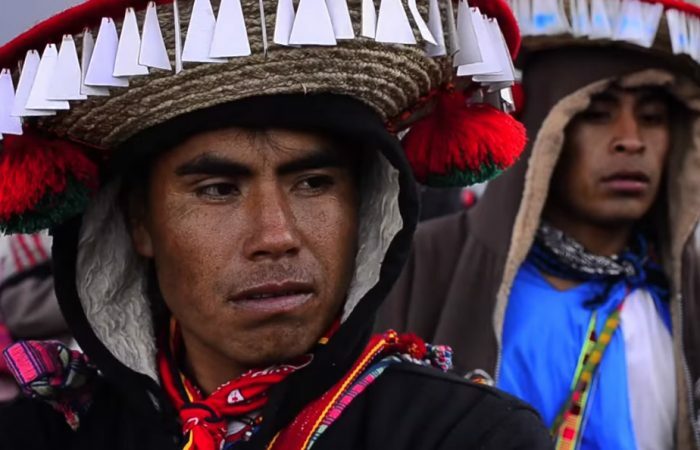 When Argentine filmmaker Hernán Vílchez made his way up into the remote Wixarika community of San Andrés Cohamiata Tateikie high in the Western Sierra Madre of Mexico, he knew he would be entering another world. What he didn’t know was how deeply it would change his own life. The movie tells the story of the Wixarika or Huichol people, one of the most intact precolonial people remaining in the Americas, and their battle to save the sacred site upon which their cosmovision depends from Canadian gold and silver mining operations. It’s a story emblematic of a horrifically destructive industry at work all over the world, and at the same time unique to this time and place and culture, and it’s a story that’s very much alive. Huicholes: The Last Peyote Guardians, a beautiful and profound new film just released on demand at www.huicholesfilm.com, breaks new ground on many fronts. 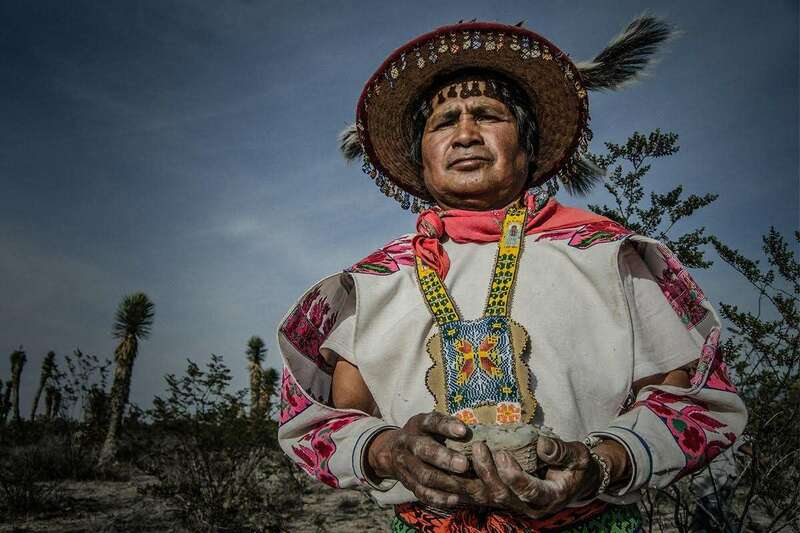 First there was the making of the film, which revolves around the pilgrimage of a single family, that of the marakame or shaman José Luis Ramírez, or Katira by his Wixarika name, to the sacred desert of Wirikuta and to the Cerro Quemado, the Birthplace of the Sun. Other films have been made exploring the colorful and deeply spiritual traditions of the Wixarika people, but none that has covered with this level of depth and professionalism the spiritual traditions of this people and the existential threat that culture now faces. The film crew, accompanied by numerous members of the Ramírez family, has also pioneered a new approach to distribution in an era of self-publishing and artistic independence. Rather than premiering the film at a prestigious film festival and then concentrating their efforts on audiences and festivals in major cities, the crew premiered the film in a way that most resembles the ancient Wixarika pilgrimage, but in reverse. The first two showings were in the pilgrimage destination, the threatened sacred site itself, the remote mountain range and desert valley of Wirikuta. The next stop was a two-day caravan up into the even more remote Wixarika territories. Only then did they take their tour to overflow crowds in Mexico’s two largest cities, Guadalajara and Mexico City. Now, due to the urgency of the message, they are trying to raise the money to go on tour with the movie: first, beginning in August, in South America, followed by Europe in September and October, and the U.S. and Canada in November. Anyone who is interested in supporting this effort may contact Hernán at hernanton@gmail.com. I caught up with the film’s director, Hernán Vílchez, and producer, Paola Stefani, and Katira and his son Clemente at the producer’s home in Mexico City last week as they recovered from the eight-day marathon. Here is the interview. Hernán: We’ve just recovered from the Five Colors of Corn and Five Functions movie release tour, and the Ramírez family is here with us. 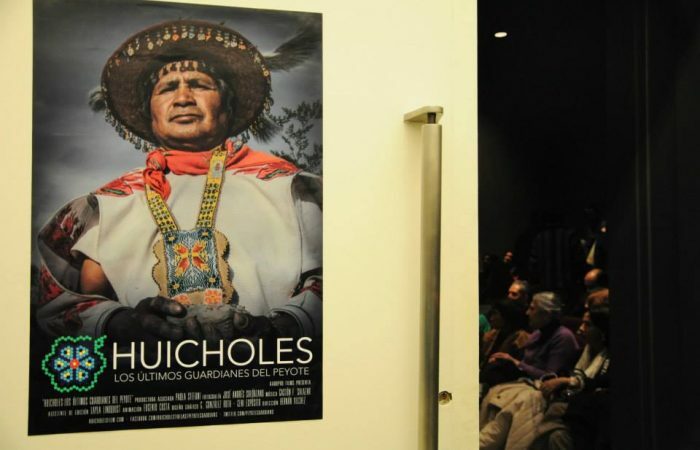 The world premiere of Huicholes: The Last Peyote Guardians was very well received and really exceeded our expectations. We’re feeling very grateful to the Mexican people but especially those who attended and also supported by helping with the diffusion on the Internet, etc., to spread the word. It’s been three and a half years since I began this work, almost as a mandate from the Elder’s Council of San Andrés Cohamiata. They asked me to do a film to tell the story of their struggle to save their most sacred site, and this is the result. Tracy: Speaking of the movie release tour, let’s talk about that first. What stood out the most for you as you traveled with this film, what surprised you, in terms of the way it was received? In particular, the different reactions of the very different audiences you were able to reach? Paola: For us it was very important to take the film in the first place to Real de Catorce and to the populations of the desert, and likewise to the Huichol territories in the mountains – this time only to San Andrés Cohamiata, although in the future we’d like to take it to San Sebastian, Santa Catarina and Nayarit. Our first interest is to take the film to the people who are affected by this conflict by the mine in Wirikuta, and so the first would be those who live in the desert, and of course to the Wixaritari. As Hernán already said, the first response was to have in attendance more than 500 people, in Real de Catorce as in Estación Catorce and in the Huichol territories. In Guadalajara, we could never have imagined that 800 people would show up and that more than half would be left outside. So obviously Wirikuta is a subject that interests many people. In Mexico City, where there was a last-minute change of venue and then it rained, about 2,500 people turned out – and what was very moving also is that the majority were young people. In the case of the Guadalajara function, there was an enormous diversity in the kinds of people who came. I think the public response – it was a very quick tour, no? In eight days we did five events and traveled more than 2,700 kilometers. So we didn’t have the opportunity to stay for a long time in each place after the function but immediately after finishing the film what we most received were words of profound thanks – in the case of Real de Catorce we were talking to high school students; in Estación Catorce we were talking to kids between 16 and 18 years old, and they were saying, ‘We’ve always seen the Wixaritari with their pilgrimages and we’ve never really understood what it was about; now we understand.’ And one of the things they told us is that they wish they had more opportunities to have access to this type of material. In Real de Catorce we had the chance to speak with ejidatarios (collective landowners, mostly small farmers) from the mountains as well as the valley, and they were grateful to be able to have access to serious information, and also something that kept coming up in the comments was the importance of making it very clear that the Wixárika people have no intention of depriving anyone of their land or their ability to make a living. One of the comments too was that it was really touching for many inhabitants of Wirikuta that the Wixárika people were there, looking in their eyes concerning the effects of the mining on their territory and how it would affect the water. In Mexico City the film ended with a light sprinkling of rain (considered as a benediction among the Wixárika people and their supporters) and applause and shouts of Viva Wirikuta, very moving as well. I think if it hadn’t rained – we had a change of venue as well, for reasons out of our control we began with the monument of the Revolution and ended up at the Monument of the Mother – and I think if it hadn’t rained as it did, I think we could have ended up with 5,000 people. It’s not the film, it’s the subject; I think the people are really sensitized to the subject of Wirikuta. Hernán: For me personally it was a great deal of emotion, the day we showed the film in San Andrés Cohamiata. There were many people who gathered, many women, many families, many children, and the authorities were the first ones that congratulated us, the commissary, the government, they were all there meeting, and we were there to show the work that we had been charged with by other authorities in 2011 in this same place. They seemed very happy to receive us and it rained then, also, and they stayed and waited it out; it was really a beautiful experience. In Guadalajara it was really impressive; we weren’t expecting that. In the beginning, in Real de Catorce, we realized that the influence of the public was more than we’d expected and that was a big surprise at the beginning, and then there was an optimism. But in Guadalajara it exceeded everything; it ended up being a little bit difficult to manage, and also the people waiting in the rain in Mexico City was also impressive. I want to share a story of something that happened in Real de Catorce. There was an elderly woman, more than 70 years old or more, humble, from the desert, who said she’d been in Real de Catorce to see the movie and now she’d come down with her grandson so he could see the movie. She wanted to buy it and share it with all her family. For me that was really lovely. Tracy: I wanted to ask about your Huichol companions – how was this whole experience for them, and how was it for you, traveling with them? Paola: We actually have the Ramírez family with us right now, so you can ask them directly. Here is Clemente. Clemente: For me it was great and for the family that was present for the Five Functions – it’s been an enormous sense of gratitude to those who brought this about. I think it caused people to really reflect a little bit on what we the Wixárika people are living. There were those who questioned our motives, whether what we were doing in participating in this film was good or bad, but we feel clear that it was the right thing to do. For me the most important thing was that people like it, that they waited through the rain and the cold, to see the movie. Tracy: Yes, I can imagine that was a really emotional experience. I would like to talk with you later, Clemente, in more depth. And for Paola and Hernán – what was it like to share this tour with such a large group of Wixárika people? Paola: Really we worked together fantastically. The crew was made up of about 15teiwaris (the Wixárika word for non-Wixárika), and more or less 25 or 30 Wixaritari (plural for Wixárika). We had a pretty complicated logistics. We left Mexico City and headed to Real de Catorce with five trucks: one designated for the film crew; one for the journalists, two for the Wixaritari who accompanied us and one for the screen and the operators of the screen. From there we went to San Andrés and from San Andrés to Guadalajara and from Guadalajara to Mexico City. Finally we arrived in Mexico with almost 35 people – more Wixaritari than teiwaris. The coexistence between us – we were all a team: the Ramírez family, and the people from the production crew. We went everywhere together, ate together, slept together, worked together on the functions, the interviews we gave; there were always members of the Ramírez family present. So the experience of doing this tour, and all the functions being open and free to the public – which is very important, Tracy, because we as the production crew have to be coherent with the message, and to have been able to carry off five free events in which more than 4,600 people saw the film – it’s a total success. And what’s more, to have been able to work together with the Ramírez family – who are all in my house still – it began May 6. We were already together and we are still together. So it’s a full month of work. Even thought the tour we did in eight days, we did advance work and Thursday we’re going to finish with a function at the theater with the media. So we have a month living with 14 adult Wixaritari, 4 children, plus the director. Everyone in my house. Tracy: Amazing. And that doesn’t even include the time you spent together during the years of production. Paola: Also people in the desert were working together to support us, coordinated by Luis Aguilar. To carry out the events in Real de Catorce and Estación Catorce, more than 15 local people worked as well to organize the event. In the Wixárika territories, there were also Wixaritari people there who worked, and also in Guadalajara, so there was a local production team in every area. It was a once in a lifetime experience. Tracy: Yes, I can only imagine… Going back in time a little now, to the production of the film. Can you talk to me about that – beginning, Hernán, at the very beginning, how you came to make this film, because as I understand it, you actually set out to make a much different film. And how was it that you came to make this commitment – because this was obviously an enormous commitment. Hernán: Yes, that’s true. We were producing a reality show series in Germany about the strictest parents in the world – a show that was really successful, and we managed the international contents, me and my partner Bani Silva, of Kabopro Films. I lived in Germany at the time. The context of filming the first short with the Ramírez family – and you can see it on Vimeo, on Kabopro films – upon asking permission to film with José Luis – Katira, the marakame, the father of the family Ramírez – they told us about Wirikuta. We didn’t know anything about it. So we met with the traditional authorities of the community of San Andrés Cohamiata to ask permission – which is something that’s necessary in any traditional community anywhere in the world, and we’ve spent years filming indigenous communities all over the planet, and so we know the codes and protocols of respect in the community. There they solicited us in a way almost like a mandate, almost like a spiritual command, as we interpret it now – because it was a meeting of the changing of the guard of 2011, when Efrén Bautista Parra took over as governor of San Andrés Cohamiata Tateikie, and there is where the elders together with him said, yes, we could, effectively; but that they wanted us to stay, and film the story of the struggle to defend, to save Wirikuta, their sacred land, where the peyote, or Hikuri, grows. So from that moment on, it was almost an obsession, to tell this message to the world and to share it in a film. That’s when the first person of the crew entered – José Andrés Solórzano; before I started the project I tried to contact Paola Stefani, but she didn’t answer, so it was really complicated to manage ourselves as a serious production. From the beginning, I should say, we consulted with a blog that was called Venado Mestizo. From there we found Paola Stefani. In the moment that we decided on this project, seeing that we’d be going on the pilgrimage – because the pilgrimage of the family would be the dramatic center of the film – so the information source we found that was the most complete and the most serious was Venado Mestizo. Getting in touch with her, we delayed a bit in this for the reason I mentioned, so we began production without being really on clear our path, which we clarified once we finally found Paola Stefani, who ended up being the third member of this team, and we began to work in an integrated way. So José Andrés Solórzano, Paola Stefani, on the production side, and obviously with the support and the absolute inspiration of the Ramírez family. So that’s how the project developed, and many people reached out, including you, Tracy, thanks to Paola’s contacts, to be able to get the fundamental material like the footage from the United Nations and Vancouver, and so many other moments from this cause that have unfolded in the last three to four years. So there I was, with this mandate, and I began to work alone, a one-person team, without financing, because obviously the Wixárika people weren’t going to finance me. I didn’t have deadlines or anything. So it was a strange time, with a language I didn’t understand. So when I’d ask something they’d answer with two sentences and it would take like five minutes to translate … the Wixárika elders would signal with a finger, and I didn’t understand. It was very severe because not only that, but there would be an explanation behind it that was directed specifically at us. It’s a very ambitious film in terms of all the themes it takes on, in terms of all the voices who speak about the topics. With the core idea being saving Wirikuta from whatever activity might put it in danger, as an entity, as a landscape, as a territory. That’s a little bit of what they understand, and what the disinformation campaign is trying to undermine in the processes, or the methods, or the environmental issues –there has not been a meeting yet. What is a fact and what the Mexican law demands and proclaims, in the voice of Jaime Martínez Veloz, Commissioner for Dialogue with Indigenous Peoples of Mexico of the current federal administration here in Mexico, that it is necessary to consult with the indigenous groups on any activity that affects their sacred sites, before doing anything – and this happened in reverse. According to the Wixárika people, neither the officials of the company nor of the government have explained to them exactly the possible effects or how the work will be done. Currently about 90 percent of the reserve is concessioned for projects of megamining in addition to agroindustrial activities that greatly affect the ecosystem, which is very delicate and very fundamental. This is a fact that comes out in the movie and it opens the door to dialog, and our intention is to open a dialog in the society in general, which is necessary to resolve a conflict that has been so problematic for Mexico and for the world in these times. Tracy: I’m imagining this must have been a very difficult documentary to film, logistically speaking, as well. Can you please talk a little about the challenges you faced as a production crew? Hernán: The challenges were constant and multiple; it was very, very rough from the beginning to the end, to the last moments of the last presentation of the Five Functions. To give you an idea; we’d just left the Huichol territory of San Andrés and we’re 20 minutes down the road and, boom! The truck ran out of gas. So here we are, in the middle of the mountains, at night, without gasoline – with a whole family with children. Fortunately a Huichol authority came along and saved us. But the situation with the truck was pretty complicated and we were waiting the whole night to resolve it. Then there was another complicated situation with a group of people around there called the Zetas. We had a confrontation with them, and there we were with the whole Ramírez family, and our production crew in the middle of this. We stopped; these people were very suspicious, and asked for our passports – it was complicated. The presence of the family was very key in generating an aura of protection and tranquility around everything, but we passed through some very worrisome moments. This ended up translating in the social events being the easiest part. In the desert and in the sierra, there were nights without sleeping, it was very cold, we were eating standing outside the truck sometimes, not much food, really at a subsistence level, and really it was a process; for the family, it was all a ceremony. They permitted us to be witnesses. When we went down to the kalihuey (temple) in the valley, it was really intense, the climb down and then back up with all the equipment and everything else; and when we went to the springs, where José Andrés sunk in a swamp up to his knees with the camera and everyone laughing all around – it was a spiritual experience, something that required much commitment and strength of all kinds. Then the climb to the Quemado from Mastranto, that was really intense and difficult, carrying all the equipment including a slider, which allows the camera to make subtle movements, all of that very heavy because it’s quality equipment, various cameras and there were just two of us at that moment and throughout the pilgrimage. Paola couldn’t be with us because she was in the city doing other really important things – so there was just José Andrés and me, in all this process basic to the film. This was the part of the trip where we did the majority of the interviews and of course the pilgrimage, and it was really difficult and demanding, physically and mentally. The equipment also suffered problems; we rented an aerial camera and the helicopter crashed in the middle of the desert, and well, everything was like that. But I think all of that comes through in the film – that it’s a case of urgency – with realistic sound, very windy, always a lot of wind. There’s a little of the heart that’s left in this because we’re going beyond an artistic work, the personal vision. Rather, it was a group project, with the whole team here and the team in Argentina – by the way there are people there who did the music and designs, the marvelous logo – all of this, it would take too long to tell. 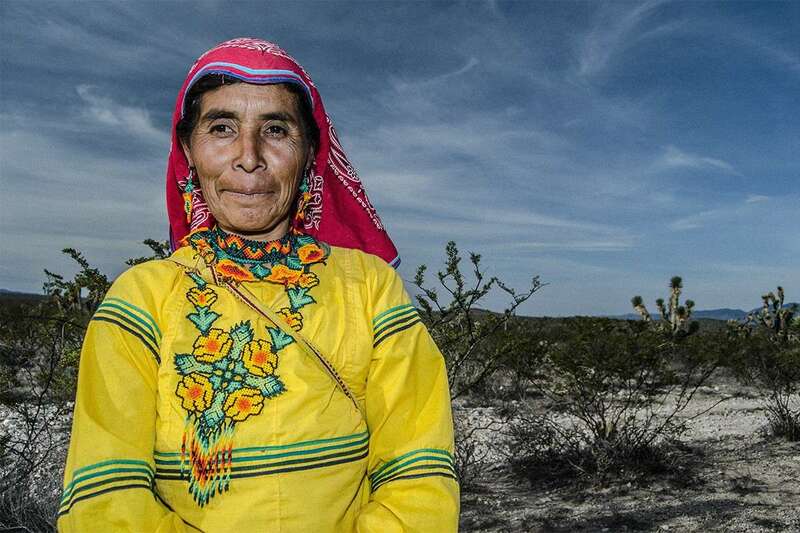 Without Paola Stefani and her Mexican team, and the Ramírez family, and all the people who collaborated from the Wixárika community, the authorities, and the people from the desert and from the villages –without them all, this movie would not have happened. To paraphrase the words of Ricardo Flores, chief engineer with Minera Real Bonanza, this movie is 100% Mexican. It’s an Argentine team that collaborated with a Mexican production. For now the director’s cut is available for download on the website; in a couple of weeks we’ll have the fully edited version with subtitles in English, for global exhibition. The director’s cut will go into a collector’s edition. The other will be for exhibition in communities, neighborhoods, up to communities in the Amazon – it will be a more summarized version, for the general public. We will then be organizing our tours, participating in film festivals, hoping to get some invitations and in fact we’re already getting some, and we hope to include on our tour places that are involved in these types of conflicts and especially those that have to do with ancestral traditions, and dealing with topics as current as the climate, water, the self-sufficiency of the people, justice essentially. Paola: Honestly the role that I played was as a link between the Wixárika people of the different communities and the specialists who participate in the documentary – I would like to mention Iván Guzmán, the brother of Lalo, who participated at my side when we began to produce the interviews and talked to Hernán to recommend who should be interviewed. This process – the film is dedicated to three people, and one of them is Ivan, who left us last year. Besides my participation in the communication, the dissemination of contents, for the defense of Wirikuta; at least my work was always inclusive and I was always attentive to all the voices of all the communities, the mining company, the federal and municipal government. So yes, I believe part of my challenge in this production had a lot to do with being able to count on experts and specialists in the various themes that appear in the movie. I’m really happy – for me it’s a very serious and respectful piece of work. And to be able to count on the participation of the federal and municipal government and the mining company gives it a vision that’s bigger than the conflict. I’m also happy with the participation of the people of Wirikuta in the film. I believe in most of the materials that have been disseminated in the past four years, those voices are always absent. The balance is always on the side of the Wixárika voice. 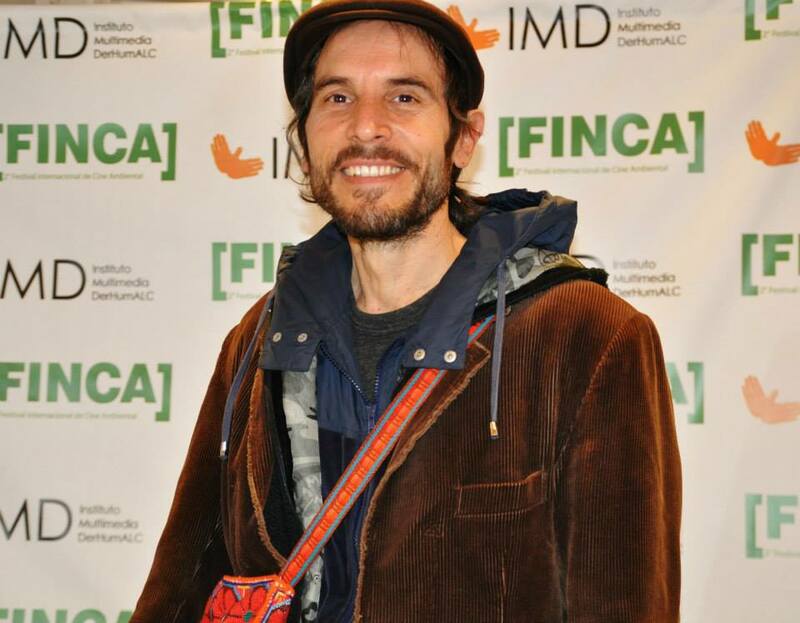 I also think the work particularly of Tunuari Chávez of the technical team of the Wirikuta Defense Front and his campaign for the right to information also opened the doors for us to be able to make this film, in Real de Catorce. In a rudimentary but precise and concrete way, Tunuari opened that path for us. And what we did with the film was concentrate the information, which facilitated access to the mass media. So for me, my challenge was and is that the film is balanced in terms of the voices, that it provides serious information, academically and scientifically speaking, and also the opinions of certain leaders – it’s very interesting for me for example, hearing in the film the voices from the Wixárika Union and the Regional Wixárika Council, the voices of Juan Carrillo and Santos de la Cruz; for me it’s a great achievement. And, well, in the part of production, working from a distance with the crew on the ground – and there were moments when we had to do other things, because we also have to work to live! I think if it weren’t for that, we could have probably finished in a year! But this is an independent film, Tracy. Tracy: How long did it take to do all the production, from start to finish? Paola: Three years – and my closeness with the Frente (Wirikuta Defense Front), with the Wixárika people, with the different communities, with many people who participated in the contents, I think I’m one of the people who most knows this movement. So I was in a way a kind of guide for Hernán, and I could say, look, this is happening. Trying to give voices to the different areas of investigation and support, because also the generation of information takes time. Three years ago we didn’t have information about the topic of water. So also the movie takes time to make because we went along making the film as the movement generated contents for the defense of Wirikuta. So producing all this tour was also a big challenge. I’m happy we did it, we did it well; we had five successful events in which more than 4,600 people saw the film. Tracy: Are there any anecdotes you’d like to share – stories you like to tell about the crazy things that happened along the way? Paola: I like the story about when in San Andrés we were just setting up the screen and a cloud came down and covered the plaza where we were working – and all around us it was clear and beautiful, only just right above us there was a cloud dropping hail. And I was thinking, we’re not going to be able to show the film, we’ll have to cancel the event. Katira said it was a blessing. And in 10 minutes there was no rain and we were able to project. More than 500 people came, and we watched it standing up because we couldn’t sit on the ground as it was wet. And with all the cold, this rain really was a benediction. Hernan: The production crew of the tour was also very diverse; people with different professions, people who lived in the Sierra of Catorce, the people from the desert, people from Guadalajara; the lesson was that if you want to do something you can do it. And in front all the people who participated in this, the heart came first. The interesting thing is that the message hit home. Not just the Wixárika message but the message of caring for the Mother Earth, and the importance of caring for the sacred territories. I think the message also in relation to the mining industry – the extractivism and the destruction of the environment. For that reason we’re very interested and we are calling on organizations that work with indigenous people and rural communities and environmental groups, that their work agenda include the possibility of sharing this movie in their communities, and that they support us in this. Tracy: With a little bit of time now to reflect, what have been the most important lessons, the most important things you’ve learned in this process? Hernán: First of all, teamwork was key; with something that began as a personal mandate, and it began to grow like a ball of snow, and heart, and sun and fire, and other very valuable people who brought other people and people began to come, even through Facebook, who knew someone, and each one gave from their heart. So with each one giving their small part, concretizing in small actions, and the audience – which also people were saying this project, what is it, who’s doing it, who are these foreigners, what are their motives, this and that, it became clear that this was an authentic project. That we were for real and that we brought a serious discourse, regarding who we spoke to and who gave us space. We had showings that included all the way up to the Wixárika authorities to activists to academics, to government and cultural leaders, and also inhabitants of the desert and the mountains; we had the municipal authorities of the region, people from the mining company, and now we are getting invitations from other communities and we’re seeing how we can bring that about. There are those extremely valuable people who helped make it happen, Rumbo Nomada, Masacalli, Nierika, Armando Loizaga, a great friend of this project from the beginning; some of those who are absent now but I think the message came from the apparent simplicity of this people that have in reality a very complex cosmovision. It’s taken years for anthropologists to come to agreement about what are the names and codes and characters and stories that intertwine in their world, that they keep alive in their practices, which has at its fundamental heart Wirikuta. And without this place, they can’t do it. And they are inviting now, in a way that’s never happened before, that people come and learn with them, that people help them share this knowledge – the part of it, at least, that can be shared, because another part that’s very sacred, very old, and can’t be explained – but knowing the only way that most people will ever come to know is by seeing the film, so they traveled with us. And it’s important to emphasize, this is not a circus, it’s not a show; it’s a presentation, a team where the Wixárika people are half plus one. Paola: For me it was like closing a cycle in my work with the accompaniment of the Wixárika people for all these years. In working for these years in diffusion on the Wirikuta case – the movie is the work of many of us, Tracy, creating a unique discourse. For me it is a very encouraging film, in the sense that people can work together for the same end, and I think the film has pulled together the work of many. On the other hand I think what makes me feel good and proud of what we’ve achieved it’s having been able to work not only with occidental people; but to be able to work with the Ramírez family, people from different communities. It’s not that it was filmed once and that’s it. It was really the sum of more than three years of work, and so I see the film and our work reflected – yours, mine, that of Flor and Iván, and all the organizations. I see it like an extraordinary retelling of a story of a movement. Also I’m very happy with the path we decided to take with Hernán to make the five functions. It reflects our intention that the message arrive in every little corner of the world. So now we begin the game of showing and distributing. There are many films that first go to festivals and spend a year going through the festivals and then premiere. We decided to premiere first, and then go through the festival circuit. Put it online, and then do the festival circuit where they invite us where we can be – because what we see is this is a story that is happening right now. It’s alive. Like Santos said in the movie, as the Wixárika people are a living culture, what we see in the movie is happening right now – this movie is a living movie. So we hope to begin a forum of dialog, but serious dialog, including all those involved. That’s why we put the film online, so that more people could be aware of this, because really the Wixárika people have supporters all over the world, and they’ve shown that wherever they go, they draw people. And public opinion is important. The price is very accessible – it’s $3.99 – because beside we believe that the message of the Wixárika people is like the point of an arrow. What happens in Wirikuta is happening in many places – throughout Mexico, throughout Latin America and around the world. So our intention is that the message of the Wixárika people be known. That’s why we did this launching campaign. Hernán: It’s a translation in teiwari of what they do in every ceremony; we have been able to share in that with the Ramírez family, which is really big – but they carry themselves very quietly, with a lot of care and with a lot of peace and family order, in a beautiful way. With their very presence, they go transmitting a kind of teamwork in community, and they taught us many aspects – one has to understand the life of indigenous people is very complicated, not just because there is discrimination, which there is, but also territorially. They have a lot of difficulties completing their pilgrimages, and the issue of the mining company would be catastrophic, if it comes about the way it seems like it would. There are so many other problems but there’s a very complicated process that involves the sacrificing of an animal – not in a mass way but as you see in the film, very well done, with a great deal of respect for the being, in a ritual context, which is something that has been carried out for a very long time. There’s the hunting of the deer, which is a sacred animal; it’s almost like hunting oneself. That’s why it forms a part of a cycle. And the deer is not endangered because of them, it’s endangered for other reasons. It’s like the peyote, which they harvest for their family’s use, is not endangered because of them, but for other reasons, such as the tourists, national and international, who come here and steal it without understanding it and even sell it and commercialize it. This is putting in danger a culture that knows how to use it, that teaches its children. For example there’s a child – Daisy one of the daughters, who is featured on the movie poster – who pulls it up by the root. They tell her, no, no, no – you have to cut it and leave the root. This plant has to stay connected. It’s like neural tissue that needs to stay here in the desert. That area is like a feminine breast, which concentrates the subterranean prehistorical waters due to the rocky formations of the Sierra. That complex mineral structure can be seen as an organic circuit, which keeps ancient information inside. Like a CPU… and through the waters the data is transmitted to the peyote, which acts as an herbal interface for the Huicholes. Therefore, consuming the cactus in their rituals, they then connect with their ancestors and their messages, renovating the cycle, the equilibrium to have good rains to feed their crops and to keep the “world” in balance. Tracy: A beautiful analogy, Hernán. Now I’d just like to ask the two of you: What’s next for the Last Peyote Guardians? Paola: We’re hoping to do more showings in Mexico and then afterwards we hope to raise the money to do tours in South America, Europe, the U.S. and Canada. Our website explains how people can support us in this. When there is a projection, where there’s a charge, we get 50%. If we go – we have to pay our expenses. Then if we make a surplus, a percentage of that will go to support projects in Wirikuta and in the Huichol territories. Something we also learned in this journey – we traveled very austerely, in the sense that they gave us hospitality in very economical places, they fed us well, but all of it really taking care of the money. We want to keep doing it this way, so that way we can bring more people. We don’t want five stars. What we want is to be comfortable – a good place to sleep so we can be intelligent when we present the film – and we want to be together. To do these Five Functions, a number of different organizations collaborated. So the idea is to join forces and lower the costs. Now we’re beginning a stage of, they are going back to the Sierra and Hernán has to go back home, and we’re going to sit with Hernán and plan the trips. One more thing I’d just like to add, the three of us, Hernán, José Andrés and I, are profoundly grateful to the Wixárika people and the Ramírez family to have invited us and permitted us to make this film. It is an honor that brings us to tears. On May 17, director Hernan Vilchez, producer Paola Stefani, cinematographer José Andrés Solorzano and the Ramirez Wixárika family, featured in the documentary, and the whole production team were already in Real de Catorce, Wirikuta preparing for the world premiere of the documentary, Huicholes, the Last Peyote Guardians. After a press conference in the courtyard of the Hotel El Ángel y el Corazón, with the sun setting over the desert, all those present walked to the Alameda, facing the old Pantheon of Real de Catorce, where the movie was projected in a theater with 300 chairs and a giant screen in the middle of the poplar trees. Local people and visitors from all latitudes made up approximately five hundred spectators. The screening of the film took place in a festive and relaxed atmosphere in which popcorn, hot coffee and sweet bread were distributed. It was a night of peaceful coexistence generating awareness. The next day the film crew came to Estación Catorce in the desert lowlands of Wirikuta. 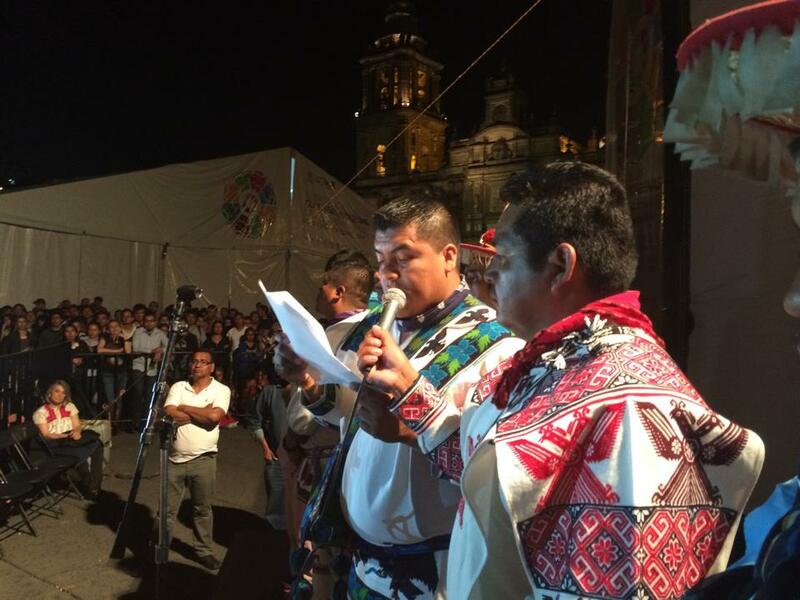 On 18 May, in a warm and starry night, the second function “Huicholes: The Last Peyote Guardians” played in the main square of the small town, attended by over 500 people. This time the film crew was accompanied by Hector Guerra, musician and member of Aho Collective. This time the audience consisted exclusively of local residents of the communities of the municipality of Catorce. For the production of the documentary this fact is very encouraging, since one of the objectives of the film is to get information to those most directly involved, who are living Wirikuta. Present were inhabitants of Santa María del Refugio, Tanque de Arenas, Tanque de Dolores, Carretas, Wadley, Estación Catorce, Guadalupe Carnicero, El Salto y Anexos, La Palma, Cañada, Poblazón, La Pila, San Cristobal, Los Catorce, Mastranto, Las Adjuntas, Vigas, San José de Coronados, Las Margaritas, San Antonio Coronados and Refugio de Coronados. 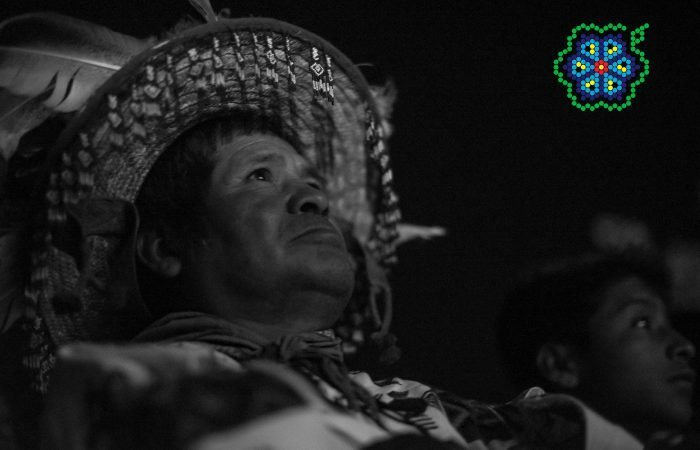 On May 20, finally the independent film “Huicholes: The Last Peyote Guardians” reached San Andrés Cohamiata, the homeland of the protagonists: the Wixárika Ramirez family. It was in this community where three years before, the community elders met in Assembly and decided to assign Director Hernan Vilchez with the task of making the documentary about the fight to protect Wirikuta, one of the five sacred lands of the Wixárika People. After a quiet afternoon, the film crew began to assemble a large screen from the production house La Maroma in the central square of San Andrés. To open the projection José Luis “Katira” Ramírez, the marakame who is the film’s main protagonist, gave a welcome speech in the Wixárika language and the film crew thanked the public for their presence. Soon 500 people from the communities of San Miguel, San Andres, San Jose, Carrizal, Cohamiata, La Laguna Seca, Las Guayabas, Pitaya, Chalate and Cebolleta were gathered here. Vilchez, Stefani, Solorzano and the entire launch team had fulfilled one of the main objectives of the feature documentary: to bring broad, comprehensive and top quality information on all aspects of the Wirikuta case to the Sierra Madre Occidental, home territory of the Wixarika People. 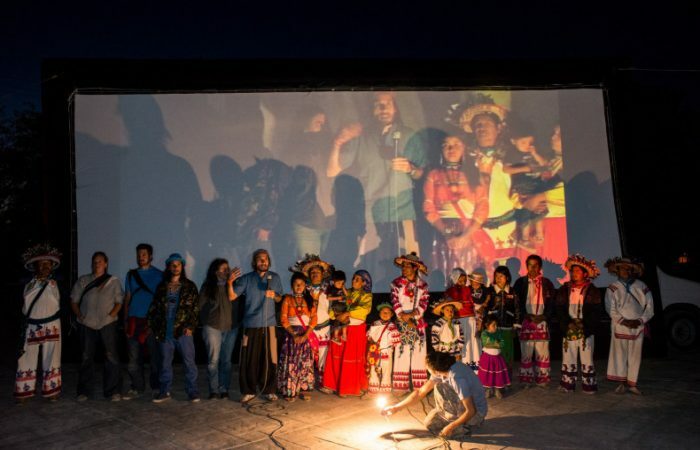 The next day the Tour Caravan “Five Colors of Corn, Five Functions,” which had grown to include 33 people, of which 18 are Wixaritari, departed for the city of Guadalajara for the fourth free screening on May 22 at 8 pm. 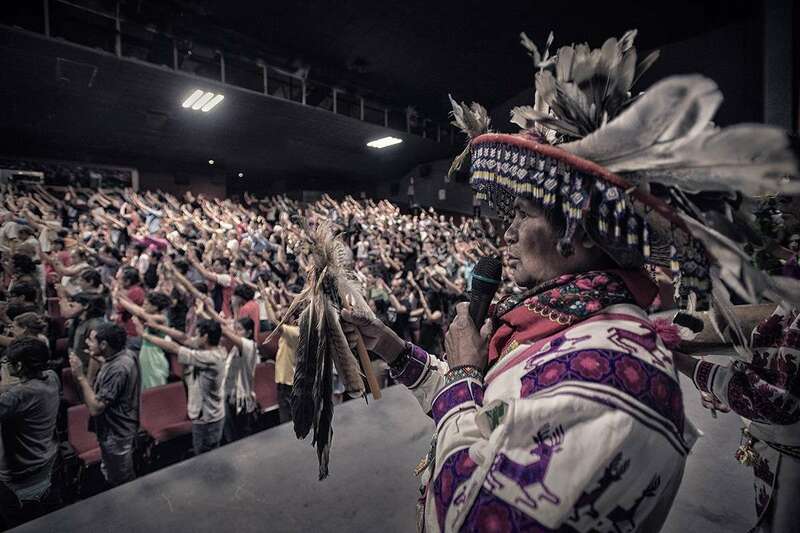 On May 22 around 6 p.m. the line to enter the feature film “Huicholes: The Last Peyote Guardians” at the Cine Foro, of the University of Guadalajara, was nearly a block long. At 8 p.m. nearly 800 people expected to be among the lucky 443 (the maximum capacity of the forum) that could get in to see the documentary. With the Cine Foro filled to the brim, Maraakame José Luis “Katira” Ramirez took the stage along with his extended family, featured in the documentary, and director Hernan Vilchez, producer Paola Stefani and cinematographer José Andrés Solorzano. This time the director and producer were silent. It was Katira who opened the projection with a ceremony to thank the deities and ask permission and blessings. The screening proceeded with sustained public interest. Meanwhile, the 400 people who could not enter for lack of space waited patiently outside the Cine Foro for some miracle that would allow them to enter the room. The end of the “Five Colors of Corn, Five Functions” tour opened on May 24 in Mexico City at 8 p.m. at the Monument to the Mother with a free public screening. 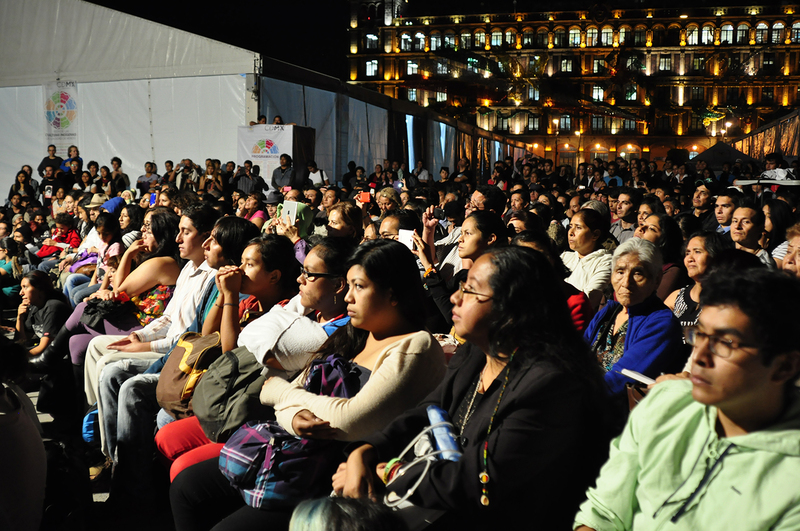 In this role, despite the torrential rain that began about 7 pm, was attended by over 2,000 people who waited standing under umbrellas for the screening of “Huicholes: The Last Peyote Guardians.” At about 8:30, without the rain stopping, Secretary of Culture of the City of Mexico Eduardo Vázquez, Producer Paola Stefani, Marakame José Luis “Katira” Ramirez and his family, Director Hernan Vilchez and Cinematographer José Andrés Solorzano took the stage to introduce the film. At the end of the screening the excited audience gave a standing ovation. We can say that this tour was very successful launch. 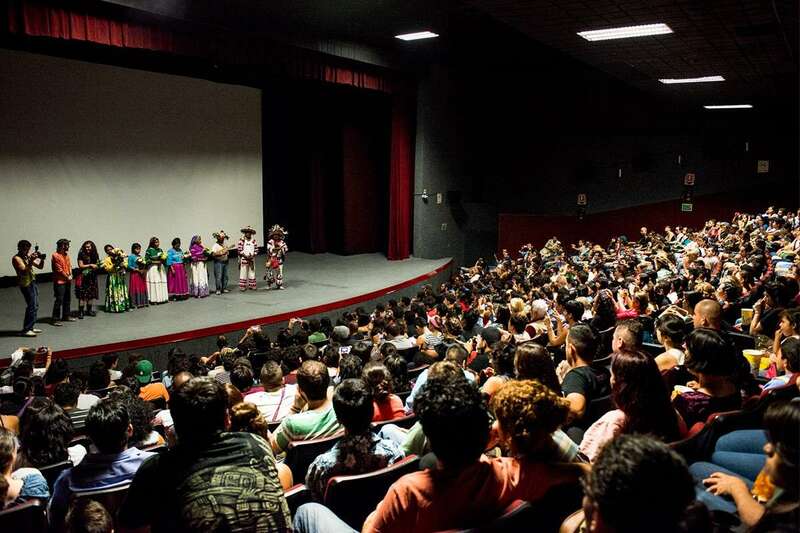 In the pre-screening before Mexico City, the film was seen by 2,100 people, not counting the 400 who remained outside the Cine Foro in Guadalajara. If we add these numbers to the 2,500 who gathered on the 24th at the Monument to the Mother in Mexico City, during the most intense rainfall so far this year, we can say that the film was seen at launch for about 4,600 persons in the eight-day tour, which took in three Mexican states, in five different locations. Here we share the video tour produced by photographer José Andrés Solorzano. 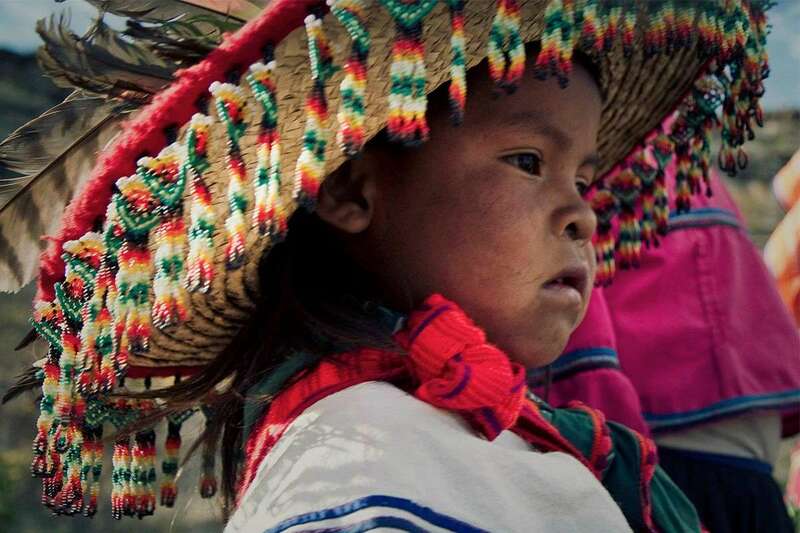 Huicholes: The Last Peyote Guardians is a story about the Wixárika People and their struggle to preserve Wirikuta, their most sacred territory and the land where the peyote grows, the traditional medicine that keeps alive the knowledge of this iconic people of Mexico. We enter the Wixárika world accompanying the Ramírez, a typical family of the Sierra Madre, in the traditional pilgrimage to Wirikuta held every year to honor their spiritual tradition. But this time something is different. The “Heart of the World”, where everything is sacred, is in serious danger. In 2010 the Mexican government granted concessions to several Canadian mining companies to explore and exploit the area, a natural reserve of 140,000 hectares of desert and hills in the Mexican state of San Luis Potosí, rich in gold, silver and other valuable minerals, and that according to the Huichol worldview, maintains the energy balance of the region and the whole planet. The main company already established in the area promises to create hundreds of jobs for the needy people of a region that already has a history in mining activities, without causing pollution or affecting the indigenous sacred areas. However, for the Wixárika People and their supporters (well known activists, artists and scientists), mining implies a mortal threat to the delicate biodiversity of this unique ecosystem, included on the list of Sacred Natural and Cultural Sites by the UNESCO, and therefore, to the survival of this ancient culture. It’s an uneven and controversial fight, which stimulates the complex global debate between ancestral cultural values , the exploitation of nature and the inevitable development of peoples.